Brian Werner built a $2 million balance and physical therapy practice in less than 10 years thanks to his detailed evaluation tests, elaborate therapy systems, and revolutionary equipment. Now he's rebranded his business in hopes of helping millions more who suffer from dizziness. An 82-year old man sits in a black, oversized chair. We'll call him John Smith (HIPAA laws don't allow us to reveal his true name). He looks like he could be your father or maybe grandfather, a favorite uncle or kindly neighbor. Large black straps come over each shoulder locking into another strap stretched across his midsection. The space-like goggles placed neatly over his eyes give the appearance that he's ready to be launched into orbit. The chair is affixed to a gyroscope-like structure that appears as if it was built on a sci-fi movie set. A press of a button and John's seat turns him sideways then upside down. He will be spun and contorted for only a few minutes—and he's cured. It's easy to envision a crowd of children with snow cone stained lips at a state fair lining up to take a turn on this apparatus. But this is no carnival ride. It's an Epley Omniax® Chair. It's John's chance to stop feeling like he's riding a merry-go-round when he sleeps at night. 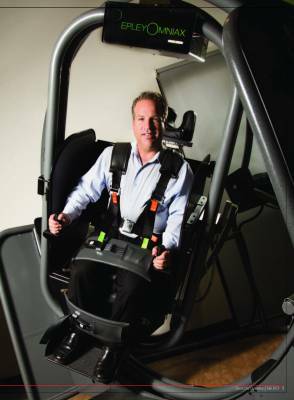 The Epley Omniax Chair is one of many devices and procedures that Brian Werner, PT, MPT, uses at his recently rebranded Fyzical™ Therapy and Balance Centers in Henderson and Las Vegas, Nevada. The chair helps patients suffering from the effects of Benign Paroxysmal Positional Vertigo (BPPV) and other vestibular disorders return to normalcy. His clinics specialize in diagnosing and treating patients with all types of peripheral and central nervous system disorders of the balance system. Werner has a passion for helping those who struggle with dizziness. After earning his Masters in Physical Therapy from Northern Arizona and working as a PT for several years, he helped open and operate several balance centers starting in Las Vegas in 2001. "By 2005 I got the entrepreneurial seizure," Werner laughed. "Once you've worked 80 hours a week for someone else, you want to try and do your own thing." Balance disorders are the third most common complaints to primary care physicians and in emergency rooms. They're the number one complaint in the elderly population. Thirty percent of the elderly in this country will suffer from vertigo; that's 12.5 million Americans. And as many as 475,000 hip fractures annually are the result, a devastating accident that 25 percent of seniors die from within a year of it happening. The stats are only going to grow larger. "Baby boomers are growing older. The stats aren't going to change. That means more people will be going to doctors with balance or dizziness problems. I knew there was going to be an increased need for this type of specialized care," Werner said. "I'm one of the first to drive a business model towards it in the nation." Patients undergo a series of evaluations upon arriving at Fyzical™. Doctors of audiology conduct comprehensive hearing and inner ear testing. Next, a Computerized Dynamic Posturography (CDP) test is administered. It identifies with objective evidence where patients' balance problems are stemming from: Is it in their eyes, their proprioceptors in their lower extremities, or is it coming from the inner ears? Last are the Videonystagmography Test (VNG) and Vestibular Autorotation Test (VAT). These examinations look for postural instabilities in the eyes or nystagmus of the eyes. "As your postural stability in standing and walking is controlled by your balance system, your eyes are also controlled by the same systems," Werner explained. "In the past, we treated based upon subjective information supplied by the patient, as we didn't have the technology or really know how to measure the balance system well. Now, we practice evidence-based medicine," he added. "We can identify what's causing the balance problem in 90%+ of the patients just by a battery of three or four tests." Many of Werner's patients suffer from loose crystals brought upon by BPPV. The Epley Omniax Chair aligns the ear's semicircular canal to be parallel with the gravitational pull of the earth allowing maximum force to reposition the crystals quickly and efficiently, thereby reducing the nausea that comes with the standard maneuver. The chair is ideal for patients like John Smith, who are elderly and have certain physical limitations. "I met with Dr. Epley and we became friends. I believe we were one of the first in the world to get the final versions of his chairs," Werner shared. "The guy who invented the Epley maneuver invented the chair—why wouldn't you want it? What he's using with his patients is what we're using with ours on a daily basis." Not everyone needs the Epley Omniax Chair. Other forms of treatment at Fyzical include vestibular rehabilitation, which is repositioning maneuvers, adaption training, and habituation exercises. Balance retraining physical therapy is also offered, a combination of vestibular rehabilitation with orthopedic management or standardized physical therapy. "That's the beauty of the model we've developed. There's the balance program and there's pain management. We want it to be a seamless program between the two," Werner urged. "That's perfect because most of our patients are older. They don't walk in with one problem. They have multiple problems. We can take care of them all." Fear can neutralize and make ineffective even the most dynamic therapy treatments. If a patient is afraid of falling while training, he or she may never fully recover. Werner identified this issue and developed a way for his patients to maximize their treatment sessions while providing reassurance that they're completely safe. "I was a gymnast through high school and college. When gymnasts practice, they're at times in harnesses and attached to ropes in case someone falls. That way they can minimize injuries," Werner said. "I came up with the same principle as it pertains to therapy." Werner employs a safety gate system at Fyzical. Patients wear a full-body harness attached by dynamic ropes to a ceiling-mounted trolley system that slides along a track. Patients can perform a full array of exercises while sliding along the 100 to 120-feet of track. And they're easily switched from one track to another as they progress from one phase of therapy to the next. "The patient needs to experience the very edge of their ability and at the same time know they're not going to get hurt. Our safety gate system is there as a precaution. They'll still fall, but they fall in their harness and not to the ground," Werner clarified. "Patients get so much more out of their therapy by being able to push themselves without being afraid. We're one of the first in the U.S. to use this approach." To find out more about Fyzical's balance programs, visit www.fyzicalbalance.com.